Galatasaray are close to the title after an impressive comeback in the Kıtalar Arası Derbi. Fenerbahce coach Aykut Kocaman has named an XI similar to this all season – ten of the positions featured his most-used individual in that role. The exception was Moussa Sow, who only arrived from Lille in January, but has been a regular upfront since. Miroslav Stoch has shared the left-wing position with Caner Erkin, while Serdar Kesimal competes with Fabio Bilica and Bekir Irtegun for a place at centre-back, but this was a typical Fenerbahce XI. Fatih Terim also called on a familiar XI for Galatasaray. This is representative of his usual side, with some slight exceptions – Necati Ates, like Sow, is a January signing and has edged out Milan Baros. Engin Baytar has only become a regular since the departure of Colin Kazim-Richards, while on the left Albert Riera has started more games, but Emre Colak has been preferred in recent weeks. This was an odd game – Galatasaray played better for the vast majority, but after Fenerbahce went 2-0 up with two extraordinary goals, it was they who were in the stronger position. The two sides used different formations, which resulted in an interesting tactical battle. Fenerbahce used a 4-2-3-1 with the wide players forming a second bank of four without the ball, while Galatasaray were a rough 4-4-2. The game was open and exciting, with a quick – but not over-fiery – feel. Both sides were fluid, got their full-backs forward well, and wanted to win the game. The home side’s shape actually looked quite poor early on, but they found themselves 2-0 up midway through the first half. Sow lacked support, often had to fend for himself with long balls hit down the centre of the pitch, but held the ball up well and made some clever runs into the left-hand channel. His overhead kick was a superb finish. An interesting battle was going on in the centre of midfield – although Galatasaray were 4-4-2, their central midfielders rarely sat side-by-side. Usually, they had Felipe Melo sitting watching Alex, and Selcuk Inan playing higher up the pitch and pressing the two Fenerbahce holders. Melo didn’t play the deeper role well though, and Alex easily moved away form him to the left, most obviously for the second goal he thumped into the top corner from 25 yards. That meant Galatasaray had to come out and press, which can be difficult when you’re playing 4-4-2 and have two strikers doing little without the ball. The danger with pressing with a 4-4-2 against a 4-2-3-1 is that your two holders will get sucked into a battle with the opposition holders, and leave their number ten free. That would have happened, but Galatasaray were brave in pushing left-sided centre-back Semih Kaya high up onto Alex – a couple of times Semih looked uncomfortable, but managed to get a tactical foul in, to stop Fenerbahce breaks. The home side rather went into a good lead too early, so no longer had to attack and got dominated. When they did go forward, however, they did so intelligently. With neither Johan Elmander nor Ates dropping into the midfield, Fenerbahce had 3 v 2 in that zone. 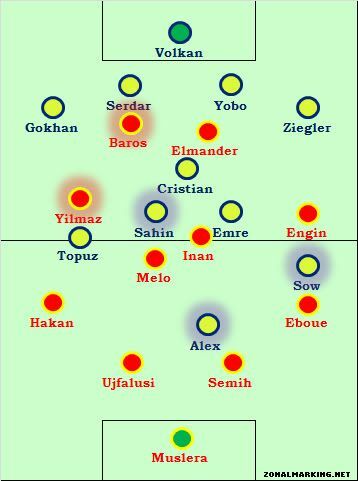 Inevitably, the Galatasaray wide players got sucked inside to help out, and then Fenerbahce could bring their full-backs forward into play. Galatasaray were actually doing something similar at the other end. They tended to play very good combinations in central zones, with Inan moving forward into the hole and Colak drifting in quickly from the left flank, which meant those two, Ates and Elmander formed a tight square – and this eventually resulted in Elmander’s goal. Before the goal, they’d been building up play in the middle then switching the ball outside to a full-back. Hakan Balta and Emmanuel Eboue got forward (Stoch didn’t track back well, but was a threat on the break with his pace), and Engin Baytar stayed wide on the right and often popped up unnoticed on the overlap. But this was basically a classic 4-2-3-1 v 4-4-2 battle. 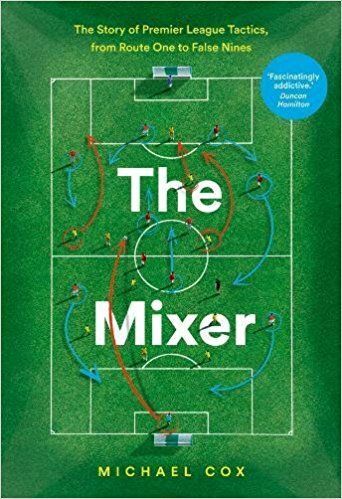 The 4-2-3-1 had a numerical advantage in midfield, got players into space between the lines, and had a central attacking playmaker in Alex. But the 4-4-2 could take advantage of the 4-2-3-1’s lack of protection for their full-backs, and the lack of a spare man at the back – that proved crucial for the goal. The second half centred around one substitution on 63 minutes: Kocaman’s decision to take off Stoch and introduce another holding midfielder, Selcuk Sahin. Terim also made a couple of changes – straight swaps with Baros and Aydim Yilmaz on. But Fenerbahce’s change meant a change of system – Sahin went to the central midfield zone, so there was suddenly a gap on the left. It took a while to sort out who was now playing there, and Eboue took advantage of that immediately by storming forward unchecked and flashing a cross across the box. 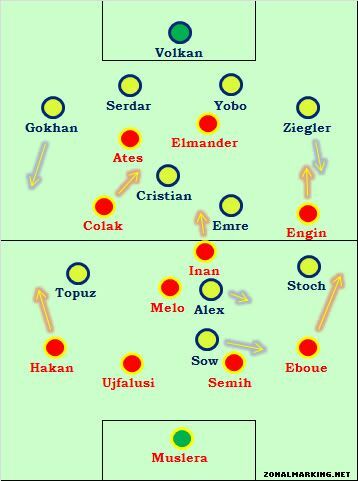 When Kocaman’s instructions were understood, it was now obvious that Sow was being asked to play out on the left and block Eboue, with Alex moving forward to become a false nine, in a shape that was 4-1-4-1, or 4-3-3 – but basically with ten men behind the ball, and Alex upfront alone. This was a mistake – Alex couldn’t hang onto the ball and Fenerbahce couldn’t get up the pitch, which was a particularly frustrating situation as Sow had been holding the ball up so well. Galatasaray no longer had to worry about Alex between the lines, could leave 2 v 1 at the back, and focus their other eight players on attacking. It was relentless pressure in the second half. Kocaman used this system for 15 minutes, then realised his error and removed Alex to bring on Issiar Dia, more of a physical presence. But even then, they couldn’t relieve the pressure and Galatasaray eventually got an equaliser after a set-piece. With the situation in the league – the away side nine points clear at the top with three to play – Galatasaray were now happy with a point, while Fenerbahce clearly weren’t. Terim brought on Riera for Elmander – a winger for a forward, while Kocaman did the opposite – Mehmet Topuz off, Henri Ntsama on. Galatasaray now played more defensively, but still managed to hit the bar seconds before full-time. Two stages here – first the simple formation battle, where the two sides had different areas of strength, and knew how to work this to their advantage in attacking zones. Then, the 15 minute period when Alex struggled alone upfront, which allowed Galatasaray to pile on the pressure, something Fenerbahce never recovered from, and Terim’s side effectively won the title tonight. Great work ZM,But turkey league have a new playoff system so their difference is about 4,5 points in the end. Oh I wasn’t aware of this – how does that work? - The Turkish Super League will finish on the 8th April, after 34 rounds of league matches. The top 4 teams at the end of the season will enter a playoff. - The teams involved in the playoffs will have their points earned during the league halved, given the first placed team an advantage. If for example is a team finishes with 63 points, their halved points will amount to 31.5 points, if this situation is to arise +0.5 points will be added and the team will start the playoffs with 32 points. - The playoff teams will play each other twice (Home & Away). The league champions will be decided by adding the points gained in the league to the points won in the play-off. The goal averages will be wiped clean and every team will start with 0 goals scored / 0 goals conceded. - The winners of the normal 34 week season will be given a Champions League qualification space. The winner of the playoff and therefore the championship will earn a Champions League automatic qualification. Slow Alex can’t be a false nine. But Aykut Kocaman couldn’t understand it yet. I don’t believe that GS won the title tonight because play-off matches aren’t played yet. Anyway, I’m a Besiktas fan and the result is okay for me. 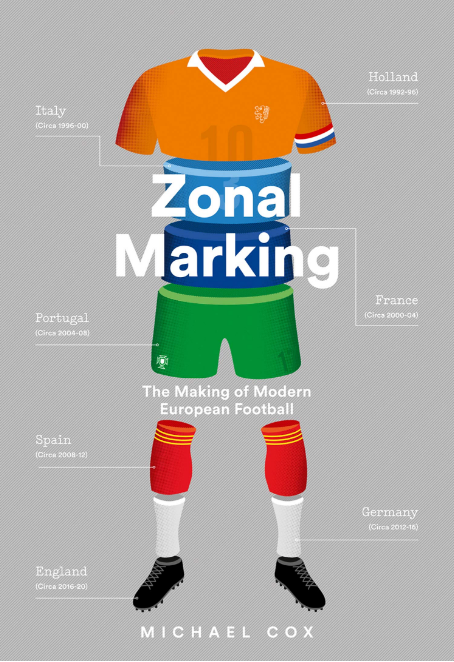 Thanks ZM for analysing Turkish football matches. Thank you so much Mike for covering this game! It is good to see articles on Turkish football on this wonderful site. As the other friends said above, the Turkish league has a different system this year, and there will be a play-off among the top four teams at the end of the regular season (they will play against each other at home and away, six games total for each team); the reason is that the company who owns the rights to the broadcasting lost a lot of money last summer, when a lot of fans terminated their subscriptions because of the math-fixing scandal (who would like to witness corrupted football anyway, right?). Then, in order to compensate the loss of the broadcasting company, the wise guys at our corrupted federation came up with this ‘brilliant’ idea of play-off so that more derby games could be played throughout the year and more high ratings could be achieved. That is the story… Because of that, nothing has been decided yet and the race to the title still continues. Not a criticism ZM, this site is fantastic but I cant help but notice the lack of articles regarding Barcelona/Real Madrid recently? Not trying to be a fanboy or anything as I feel its important that less prominent leagues/teams are covered here, but its still interesting to get an expert view pn how these sides are evolving. One thing that i’ve wondered recently is how Barca will play without Abidal, considering how important he is for Barca’s tendency to switch between a 3 and a 4 at the back. Thanks Michael for covering our great derby. You probably don’t follow the Turkish league regularly, but this match has been a very typical summary of Fenerbahce’s games this season. Go up 1-0 (rarely 2-0) ahead in the first half, then stop attacking, stop holding up the ball, and just do aimless long balls and invite pressure and get dominated by the opposition. If we’re lucky, we’ll hold on to 1-0, if we’re not we’ll get a draw. What pisses me off even more is Aykut Kocaman’s insistence on switching to 4-3-3 (actually more like a 4-5-1) upon taking the lead, from the usual 4-2-3-1, which has been Fenerbahce’s default formation since the Daum era (2003). I could understand if he’s a fan on 4-3-3, but this formation is simply useless offensively with Alex as the number 9 (or false-9). He lacks the physique for a number 9 and the pace for a false-9, and he’s best as a trequartista, preferably with 2 strikers in front of him. Besides, with the 4-3-3 switch, the striker in 4-2-3-1 is moved to the wings, but he (Moussa Sow in this game) can’t perform the defensive duties or track back like a natural winger, which creates defensive problems as well. I really can’t see how he thinks this would benefit the team. I wish Aykut Kocaman could be more open to changes (he’s never used anything other than 4-2-3-1 or 4-3-3 in his two years in charge), and sometimes opt for 2 strikers, and even more importantly 3-at-the-back formations for some games. The changes he made in the second half, `Selcuk Sahin for Stoch` in particular, was just suicidal. But he’s been doing this the whole season, so I wasn’t surprised. Thanks for that link, the first two goals were world-class, it was worth watching!